You can find countless variations on meat pies made around the world. Some are baked, some are fried, some are prepared in deep dishes and others are intended to be eaten by hand. The only thing they have in common, from empanadas to Jamaican "patties" to the steak and kidney pie of England, is a crust on the outside and meat on the inside. In America, they're most often meat and gravy in a pie crust, with or without vegetables at the whim of the cook and local tradition. Preheat your oven to 375 degrees Fahrenheit, unless directed to use a higher or lower temperature in your recipe. 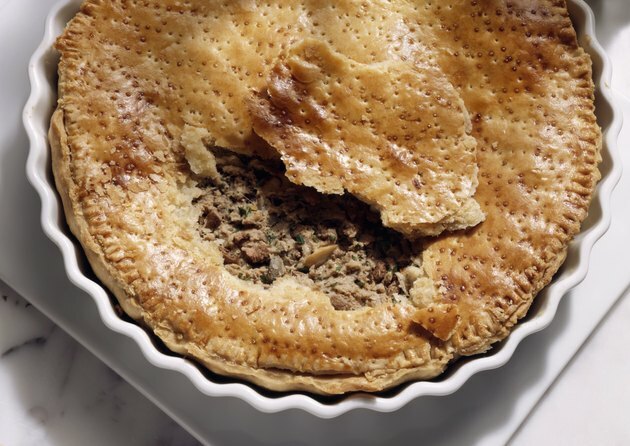 Place the meat pie on a parchment-lined baking sheet, to catch any drips if the pie bubbles over. Brush the top with a beaten egg, if you wish, which will give it a rich golden color. Put the pie on the bottom rack of your preheated oven for 30 minutes, to cook the bottom crust. Transfer the pie to the upper rack of your oven, and bake for a further 25 minutes or more, as directed in your recipe, until the crust is golden, and the filling is bubbling and steaming. Cool the pie for 10 to 15 minutes, then cut and serve it. For smaller individual pies, place them on the sheet pan and bake them entirely on the upper rack for 30 to 35 minutes.